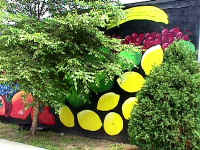 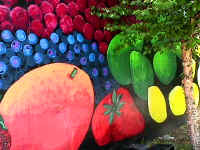 (yr. 2000 ) American Harvest Specialty Foods had a history spanning 10 years of welcoming art on the outside walls of its building. 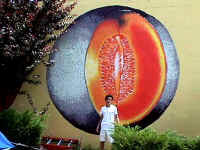 Below, the giant Cantaloupe by Mark Nerys, then, 15 years old and a Franklin High School Student from Somerset. 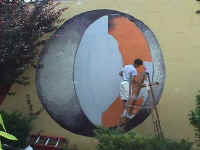 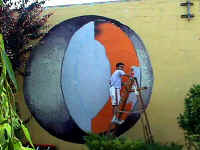 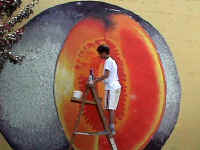 Mark was on a ladder all week, blending colors and painting a melon big enough to squash him if it rolled off the wall. 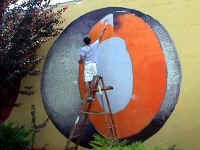 Mark was recognized in his school district for art achievement, winning Outstanding Student in Visual Arts in 2001. 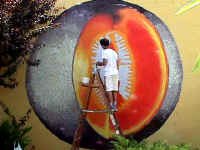 Building bridges between artist and community for 18 years and now, April 2009, VAL is relocating to the wild mountains of Mexico where we will continue to work with Photoshop, computers, camcorders, teaching, learning and playing our way onto the next adventure, replete with hot Mexican dirt, scorpions and even wild horses leaping taxi cabs barreling through the woods.